Just when I think a new product isn't going to impress me, I see another innovative one that makes me think, "Gee why didn't I think of that?" 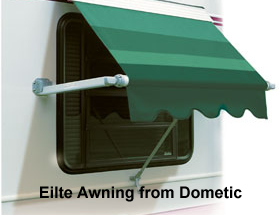 Dometic has come out with new universal A&E hardware (the most popular RV awning hardware in the world). To me, the best thing about it is its rain shedding capabilities. It senses when there it water collecting on the awning and lowers itself in one corner so the water can run off. 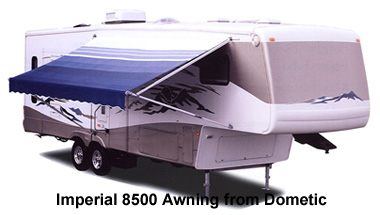 The hardware can be used on the company's 8500 Imperial and 9000 Elite Awnings.